Phase 1 of The Wharf project is currently scheduled to open in October 2017, with Phase 2 breaking ground sometime in mid-2018. Phase 1 of The Wharf project (about 1.9 million square feet of mixed-use development) is currently scheduled to open in October 2017, with Phase 2 breaking ground sometime in mid-2018. 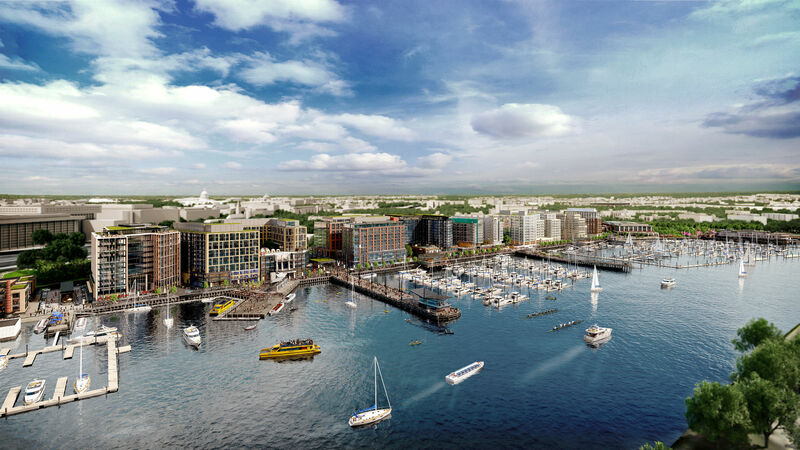 Washington, D.C.–based firm Perkins Eastman DC will continue to act as the master planners and master architects of The Wharf, allowing for continuity between Phase 1 and Phase 2. SHoP Architects will design two office towers in Parcels 6 and 7 with related retail spaces in collaboration with WDG Architecture, who will act as the architect of record. ODA will design mixed-income multifamily apartments and related retail on Parcel 8 of the project, while Rafael Viñoly Architects will add luxury condominium residences in Parcel 9. Morris Adjmi Architects will be designing their first commercial building in Parcel 10, adding more office space to the development. Washington, D.C.–based STUDIOS Architecture has been chosen to design the multi-use marina services building. Hollwich Kushner (HWKN) will be designing the Wharf Marina, and S9 Architecture will be responsible for Wharf Marina Operations and the Cantina Marina Pier. Michael Van Valkenburgh Associates (MVVA) will design M Street Landing, the outdoor space connecting the waterfront to the Arena Stage. Wolf | Josey Landscape Architects will continue their work from Phase 1 of the project, which included the detailing of The Wharf Promenade, The Channel rooftop, and other public space. The first phase of The Wharf will open on October 12, 2017. More information about The Wharf is available here.